In this work, we introduce a profiling scheme for modern functional logic languages covering notions like laziness, sharing, and non-determinism. Firstly, we instrument a natural (big-step) semantics in order to associate a symbolic cost to each basic operation (e.g., variable updates, function unfoldings, case evaluations). While this cost semantics provides a formal basis to analyze the cost of a computation, the implementation of a cost-augmented interpreter based on it would introduce a huge overhead. 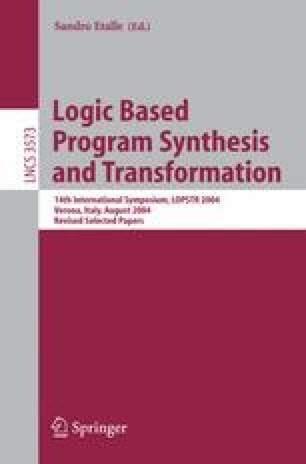 Therefore, we also introduce a sound transformation that instruments a program such that its execution—under the standard semantics—yields not only the corresponding results but also the associated costs. Finally, we describe a prototype implementation of a profiler based on the developments in this paper. This work was partially supported by the Spanish Ministerio de Educación y Ciencia under grant TIN2004-00231, by Generalitat Valenciana GRUPOS03/025, by the ICT for EU-India Cross-Cultural Dissemination Project ALA/95/23/2003/077-054, and by the German Research Council (DFG) under grant Ha 2457/5-1.